After many, many grocery store trips where I lamented the price of bean sprouts for my Pad Thai and Pho, I decided to try and sprout some myself. My mom recently sent me a wonderful cookbook, Bar Tartine, that has methods for making and preserving all sorts of great food products. When I saw the section on sprouting, I knew this was something I could do! All you need are beans, a jar, a strainer and water. What could go wrong? Before I continue, I want to mention that, while I love cookbooks for ideas, I rarely follow the recipes without modifying them to suit my tastes or timeframe. For these sprouts, however, I followed the directions to a T. The sprouts I got at the end are crunchy and fresh and delicious just as they should be. My one complaint = I ended up with WAY more sprouts than I anticipated! 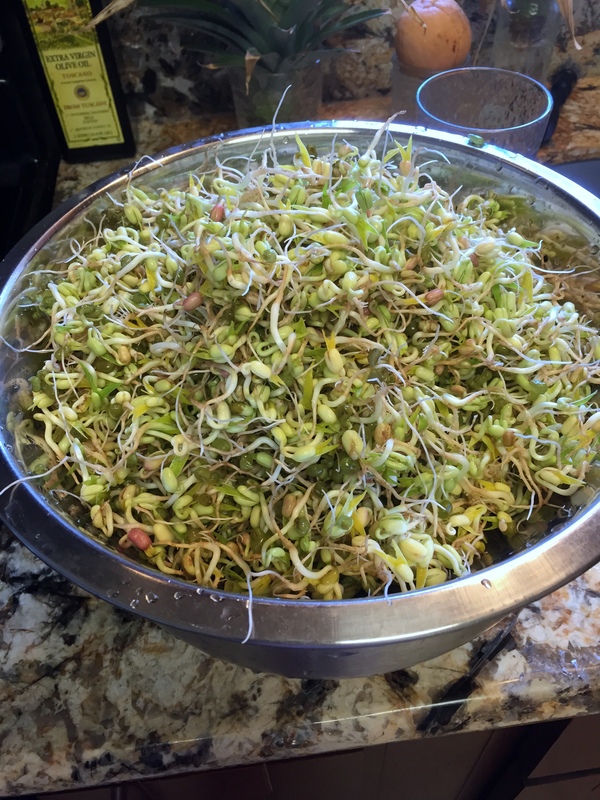 The cookbook said that I would get sprouts as a ratio of 1:2 when compared to the original beans to the finished sprouts….try 1:8! I realized only after I started the logically you cannot have a big bean sprout only take up double the space as a tiny bean. Every day the sprouts kept doubling in size. At Day 5, I decided enough was enough and rinsed and refrigerated them….and started texting friends trying to pawn of the sprouts on anyone who might want to eat some. Luckily, I found enough takers so that the Roomies and I won’t be eating exclusively bean sprouts for the next week. Thank goodness! Below is a gallery of the sprouts’ progress from bean to sprout. Keep scrolling to the bottom for the sprouting method. I will post a recipe using these bean sprouts soon. Keep an eye out! Day 3: morning – doubled again! Day 5: morning – doubled yet again! Day 4: morning – doubled again! Very good! Love those sprouts! You have food here??! I must tell my wife, the home chef, about this site, and pry her away from AllRecipes..Being the first in town to make our own Chinese food, we used to grow our own bean sprouts, until low prices and reliable availability became common in local stores. They were sold in bulk, but people ignored the tongs, and grabbed handfuls, until fear of contamination got them pre-packaged in one-pound glassine bags. Thank you! I love having new people find my site. 😀 I am happy to have the option of growing them myself so as to avoid the tongs vs. hands situation! Here , bean sprouts are easy to find but are not very cheap (food costs are extremely high here 😕). I am always looking for ways to grow or make my own food instead of buying! I will keep checking out your site for more ideas. If you ever need a recipe for a specific dish, let me know. I probably have one! I have a giant stack of recipes that I have been working on but have yet to post. I’ve been sprouting mung beans for years, as my mother used to do it. My favourite way to eat them is on wholegrain toast with peanut butter! A little unconventional perhaps, but delicious nonetheless. I’ve also learned to sprout only small amounts at a time otherwise I can’t get through them – they certainly do expand in size!